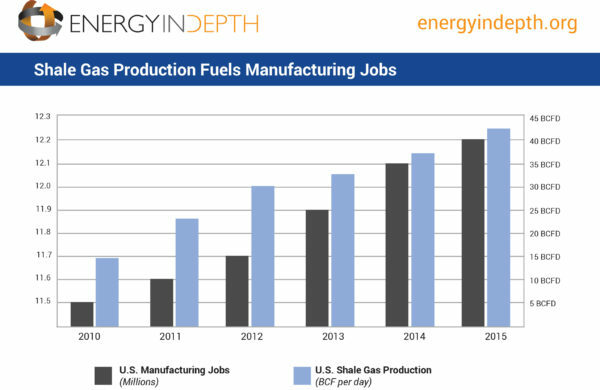 Overall, these findings demonstrate how shale development has benefited the U.S. economy – and U.S. manufacturing specifically. However, some questions remain about the magnitude such benefits cited by report. Greater domestic natural gas supply spurring U.S. manufacturing growth can be seen across the country. For example, the latest data from the American Chemistry Council (ACC) estimates that in chemical manufacturing alone, roughly $185 billion in capital investment has been announced for 317 projects or expansions that make use of the wealth of domestic shale gas. More difficult to observe directly is expansion related to the cheap electricity costs from natural gas generation. According to the report, between 2007 and 2012, natural gas prices declined by about 50 percent, while natural gas production grew by over 23 percent during this same period. To determine the impact such a substantial price decline had on U.S. manufacturers, the authors analyzed the effect of low natural gas prices on county level employment. Doing so, the authors claim, gave them a more accurate picture of the effect when compared to using natural level data, as other studies have. Such “previous studies” mentioned in the report include a 2016 study from the London School of Economics which examined the same time frame and concluded that shale development helped generate over 350,000 manufacturing jobs. Moreover, other studies which the RFF authors mention in their literature review found significantly increases in U.S. manufacturing employment than the RFF study. For example, a 2015 study by Hausman and Kellogg for the National Bureau of Economic Research concluded that if gas prices didn’t decline following 2007, the industry would see a similar pattern of growth as the rest of the economy – about 3.4 percent. By factoring in the price decline of natural gas, Hausman and Kellogg found employment increases of 9.1 percent for gas-intensive industries, up to 14 percent for the most gas-intensive industry, fertilizer manufacturing. In total, Hausman and Kellogg found that the shale revolution led to a benefit of $48 billion per year for natural gas consumers and producers between 2007 and 2013. Additionally, the U.S. Energy Information Agency (EIA) reported in 2013 that the increased supply of natural gas was indeed a major benefit to manufacturers. In short, because natural gas is so vital to American manufacturing as both a feedstock and for electricity generation, it’s difficult to imagine a 50 percent decline in natural gas only increasing employment by 0.6 percent nationally and 1.8 percent in the most gas-intensive industries – a criticism bolstered by countless other studies. In addition to examining the impact on a county level, the RFF study took into account other factors that potentially could impact manufacturing employment. Notably, the authors focused on the influence expanded liquefied natural gas (LNG) exports could have on domestic manufacturing employment. While the overall impact found is minimal, the authors’ reliance on data from the 2014 EIA report calls into question whether this impact is even smaller than their findings suggest. According to the 2014 EIA report, increased LNG exports were forecast to raise domestic natural gas prices by three to nine percent between 2015 and 2025, depending on the level of long-term LNG export growth. However, since EIA published the report, natural gas prices have continued to decline as exports have increased. In fact, the EIA reference case estimated prices to reach over $4.00 per million British thermal units (MMBtu) by 2020, with export levels topping 5.7 billion cubic feet per day (Bcf/d). 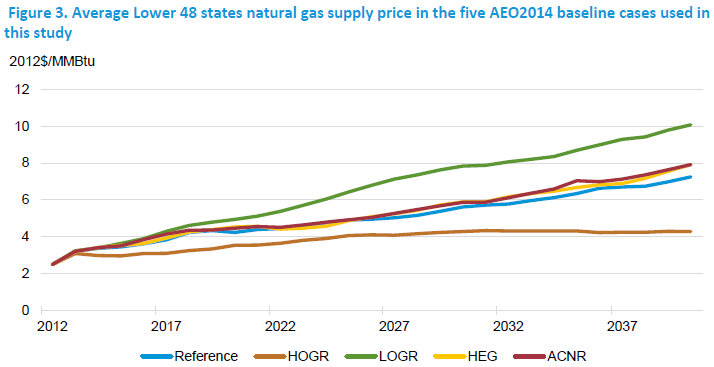 Currently, U.S. natural gas prices are just $2.81 per MMBtu, while the existing 2.8 Bcf/d of natural gas exports are expected to increase to 9.6 Bcf/d by 2020. In other words, while export levels have outpaced EIA forecasts, domestic natural gas prices still remain low. And, considering RFF based their conclusion that LNG exports would reduce employment by raising natural gas prices, since natural gas prices have dropped, these employment reductions would be non-existent. While some questions remain, the key takeaway from this report is that it’s the latest confirmation of shale development’s substantial contribution to a manufacturing renaissance in the United States. As the below EID graphic illustrates: as goes shale gas development, so too does manufacturing. Hopefully then, as shale development continues to boost domestic natural gas production, we’ll see more and more “Made in America” labels soon.